Our View: This is the best credit card if you want to transfer a balance. You'll get 0% interest for 12 months and a low "life of balance" interest rate after that. Even if you're stuck with a small credit card debt, getting this card could save you hundreds of dollars and even up to $1,000 in interest charges alone. You need to transfer a balance in the first 30 days to get the 0% interest period. You can't transfer a balance from another BNZ card. After the 0% ends, it's 13.45% interest on any remaining transferred debt until it’s paid off. Want more options? 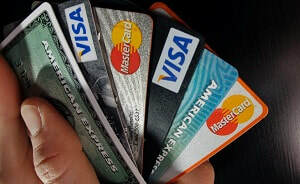 Read our Review of Balance Transfer Credit Cards for the best deals now available. ​Our View: Forget the high-end rewards such as Samsung phones - no one is going to spend $300,000 to earn one - and focus on the small rewards. Kiwis spending a standard amount on their credit card every month can redeem cashback earnings through a wide selection of "partner stores". Rewards: $1 of rewards value per $150 spent (calculated at 67 cents per $100 spent). Rewards can only be redeemed at partner stores and not taken off a credit card bill directly. Merchandise and voucher rewards start from 20 True Reward Dollars, with retailer partners including Mobil, Farmers, House of Travel, Vodafone top-up - all options are found at the True Reward partner store. Want more options? Read our Review of Reward and Cashback Credit Cards for the best deals available now. ​Our View: The BNZ Advantage Classic visa card offers the best cashback rate of 0.67% and a low card fee of $40 per year. You can put the cash you earn towards your credit card bill. You will have to spend $6,000 per year to earn back the card's annual fee. Cashback: $1 per $150 spent (calculates at 66.6 cents per $100 spent). Flybuys Conversion: BNZ $40 = 1 Flybuy. Want to apply? Review the credit card in detail here (this link takes you to BNZ's website). Read our review of Reward and Cashback Credit Cards for the best deals now available. Our View: We consider this the best card for a number of purposes. Being a Mastercard, it’s widely accepted and even though it earns fewer Airpoints than the AMEX Platinum ($1 per $75 spend vs $1 per $59 spend), if you spend up to $55,000 the difference in Airpoints Dollars earned won't exceed 200. And this card is packed with the highest status credit earn rate, Koru voucher earning and a reasonable annual fee. 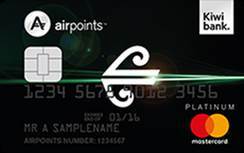 In summary, we believe the Kiwibank Air New Zealand Airpoints Platinum Mastercard is the best in class for multiple purposes. Annual fee: $150, but promotions throughout the year have seen it waived during the first year. Complimentary overseas travel insurance (as long as you use the credit card when paying for your travel costs). Earns 1 status point for every $200 spent, which assists reaching Silver, Gold and Gold Elite tier levels. If you spend $45,000 in one year, you’ll earn 225 Status points which is half the points you’ll need to reach Silver. Please note, to reach a tier, 50% of status points must be earned on Air New Zealand, Star Alliance and/or other Qualifying flights - for more details click here. Want to apply? 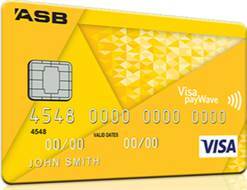 Review the credit card in detail here (this link takes you to Kiwibank's website). Want more options? Read our Review of Air New Zealand Credit Cards for the best deals now available. ​Our View: This is by far the best low-interest credit card on offer. Not only is it fee-free, but you will also qualify for ongoing six month interest-free terms on any purchase over $1,000. While it may not beat the market with the interest rate compared to the Co-Operative Bank and AMEX low-interest options, it's no more than 0.50-0.75% higher than them and the lack of fees more than compensate for this. Balance Transfers: You must request a balance transfer in the first 30 days to get the 0% interest period, and you can't transfer a balance from another ASB card. Want to apply? Review the credit card in detail here (this link takes you to ASB's website). ​Want more options? Read our Review of Low-Interest Credit Cards for the best deals now available. Our View: The ASB offers fantastic benefits with its student account, which comes with a fee-free Visa Light credit card. With 6 months interest-free on individual purchases over $1,000 and a low-interest rate of 13.50%, the ASB delivers a package that powers student living. You will need to be a student to qualify for the student bank account, but the ASB Visa Light is available for anyone to apply and is a fee-free card. Want more options? Read our Review of Student Bank Accounts and Credit Cards for the best deals available now.